So happy again with the outcome of my yesterday's post, #THINKBIGThursday. Got an email from a reader and she was relief on what I have said about "LIMITLESS POSSIBILITIES that you can do it"...she can do it! And to my WordPress followers, thanks so much. Today is Friday and what about Friday? 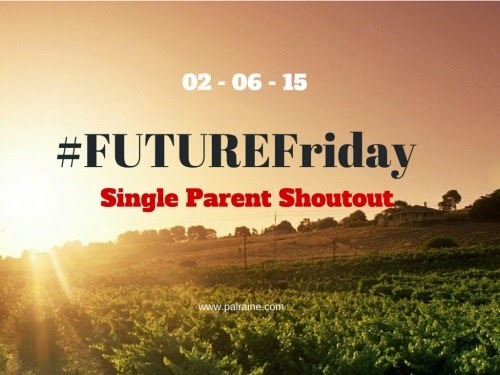 Well, as a single-parent you need also to think of your love life future, time to meet new people and make new friends --- #FUTUREFriday. Be a source of GOOD VIBES. How? Always keep a smile on your face, and don't be like a clown. Let others know that you will always be their at the back to make the place good enough! As a Single-Parent we are in the stage that after we got pregnant, the labor, the pain of separation, etc...we don't want to accept partner's, because we are still in the process of healing wounds. I know it's hard. been there and up to now I am still in that stage(a little), but need to get out from that feelings. I realize that, because my relationship didn't work doesn't mean that I'll STOP loving too! Stabilize your heart, regain a sense of a dominion mind. One way to do that is to eradicate heartache --- how? is to FREED anguish and misery. They say, you have to mend broken heart enable to survive hurting, for me I want to stay it broken. Yes, leave it broken. In that way, I have to walk around not sobbing but to practice kindness and care. And begin to shift my understanding in search for love, away from the old notion, "I WANT TO FIND SOMEONE TO LOVE ME", to "I WANT TO FIND A WAY HOW TO GIVE LOVE MORE THAN ANYTHING IN THIS WORLD COULD GIVE". With this, the whole world will have a better place. Shine with confidence and view life with a new path. With mental clarity and emotional stability in your heart you will see your entire life as a path. Remember always, that you're a fun to be with, you're a great friend, anyone would be lucky enough to have you and know you as a friend. Create a foundation with full of JOY not SORROW, Meetups and partying, giving and taking. And do not let the dark power of heartbreak lead you again! Trust yourself! Life has it's own life and the violence of heartbreak has the power to kill you. So be ready, I know single-parents are tough to handle this kind of situation. We've been to a very rough then, we can surpass it again. Right? If we love again, just take it easy. I am not saying here not to be serious(that's unfair to our future partner) --- Just pay attention, by cultivating agenda-less awareness of yourself, others, and the flow of life. And not to forget our children, still they are our first priority. Stay closer for longer and develop a non-judgmental relationship. Longing for love is like asking yourself, "IF LOVE SAFE?". The moment you fall in love and having a broken heart, both are extremely powerful situation. You need to have strong foundation of friendship if you want to make your relationship last longer. Finding time for that right person is not easy and become more challenging as you enter to a deeper and romantic stage. There are many ways to get in touch, this allows you to get closer with everyone and widen your circle of friends both new and old. Hi, This is a good post, indeed a great job. You must have done good research for the work, i appreciate your efforts..